Synthetic peptide conjugated to KLH, corresponding to amino acids 157-172 of Human Centrin 1, with N-terminally added lysine. This sequence is highly conserved in centrin 1 of many species, e.g. mouse, drosophila, and Xenopus. It is also found in human and mouse centrin 2, but is not found in centrin 3. Anti-centrin is affinity purified using the immunizing peptide immobilized on agarose. Our Abpromise guarantee covers the use of ab11257 in the following tested applications. WB 1/2000. Predicted molecular weight: 21 kDa. 1/2000, this concentration is recommended using a nuclear extract of the human epitheloid carcinoma HeLa cell line. Predicted molecular weight: 21 kDa. Suggested working dilution of 1/200 (see PMID: 17299043). Methanol fixation may be preferable for this antibody based on publications and customer feedback. Plays a fundamental role in microtubule-organizing center structure and function. Belongs to the centrin family. Cytoplasm > cytoskeleton > centrosome. Centrosome of interphase and mitotic cells. ab11257 staining Centrin 1 in mouse embryonic fibroblast cells by Immunocytochemistry/ Immunofluorescence. Cells were fixed with Ethanol (-200C) and blocking with 3% BSA/PBS was done for 30 minutes at 220C. Samples were incubated with primary antibody (1/500) in in 3% BSA /0.1 % saponin/PBS for 1 hour at RT. An undiluted Alexa Fluor®546-conjugated donkey polyclonal to goat IgG (H&L) was used at dilution at 1/500 as secondary antibody. In the image, Green staining represents gamma tubulin, red - centrin. Publishing research using ab11257? Please let us know so that we can cite the reference in this datasheet. Please see below reply from this customer regarding Anti-CP110 antibody (ab99337) & also the attached immunoblot. I am sending an immunoblot of CP110.As you will find the antibody is not working for IB either. It is giving many non specific bands. 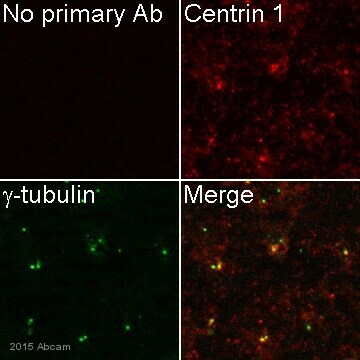 So kindly replace it and the Centrin antibody. I am not sure what IB represents but assume the customer would mean either IP (Immunoprecipitation) or WB (Western blot) application? Is that correct? I regret to inform you that I am not convinced that this antibody (ab99337) is faulty. However, I appreciate your long-term relationship with this customer and try to help you to close this case soon. Multiple bands could be due to several factors (blocking, protein degradation, secondary antibody). Since the non-specific bands are lower range than the expected band size for CP110, it may well be that the bands are degradation product. What Lane 1 and 2 represent? Identical samples? Or different preparation? How was the blocking applied (blocking agent, time and temperature)? How much protein was loaded? Has "No primary" (only secondary) antibody control was used to rule out any non-specific signal due to the secondary antibody? Furthermore, CCP110 has different subunits and the CCP110 protein can interact with other proteins such CALM1, CETN2, CEP76, CEP97, NEURL4 and CCNF. For this reason, it is essential to know if the experiments were carried out under naturing or denaturing/and reducing conditions. This information is also missing in the last e-mail and would be very important to know. Currently, we have two alternative antibodies against CP110 ab99338 and ab91415 and can offer one free of charge replacement vial. Could you please discuss the content of this e-mail with your customer and you let me know which product he wishes to test. Thank you for your below reply. We have been able to convince this customer for further informations on this complaint, please see the attached technical form and the IF images sent by this customer. Unfortunately, the two image files can't be opened so I am unable to take a look at the signal. ab99337 - WB and IP - this has not been tested in immunostaining. Since ab99337 has not been tested in immunostaining, I am very sorry but our Abpromise does not apply for this antibody. Regarding ab11257, the protocol looks fine though it would be interesting to know if the cultured HeLa cells are from the exponential phase of growth or from a confluent culture. No information is provided. Furthermore, blocking non-specific bindings with 10% BSA may be a bit too strong with cultured cells. I can offer a new free of charge vial of 11257 but not for the other product ab99337 which has not been tested for ICC/IF yet. Could you please discuss our policy with the customer to make sure he understands for which product we can offer the Abpromise. Request you to kindly look into it & advise us accordingly to do further needful on it. We have received these two antibodies and these have been checked by immunoflouresence. 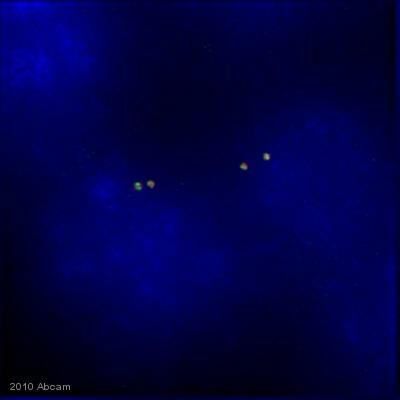 These antibodies are not working as they are not giving the required signals. We have tried all the protocols given in various references including the one provided by ABCAM.This includes trying different fixatives, detergents for permeabilization, different blocking agents and various dilutions of the antibodies. We have repeated it several times but to no avail.It has been a complete wastage of my time and resourses. My work is suffering due to this. There is no error at my side and no excuse will be entertained in this regard. I just want the antibody to be replaced asap, either with the same cat no or some other catalog no and both should work for sure . Please don't waste our time by multiple formalities, and do the needful asap. Thank you for your enquiry regarding our two products. I am very sorry to hear that you are having problems with this antibody. Could you please provide some details of the protocol used and complete the following form (attached as a word document). It would be much appreciated if you could attach an image to the response. Thank you very much for your recent review of ab11257. Your review is now published on our website. Since the results were below average, I'm contacting you to see if we can help resolve this problem. I would recommend reducing the amount of protein loaded to 20-30 ug, and you can also block the membrane overnight at 4C then incubate with the primary antibody for 1 hour at room temperature. These steps may help reduce the non-specific bands on the blot. We do fully guarantee this antibody to work with human samples in Western blot, so if you would like a replacement antibody or a credit or refund, please let me know your original order number or PO number and I'll be happy to set that up for you.